Both events will host a marketplace and panel discussions by employers and providers, supported by apprentice ambassadors and independent advice organisations. For further details and to book a place, please vist www.c360.org.uk/NAW2019. 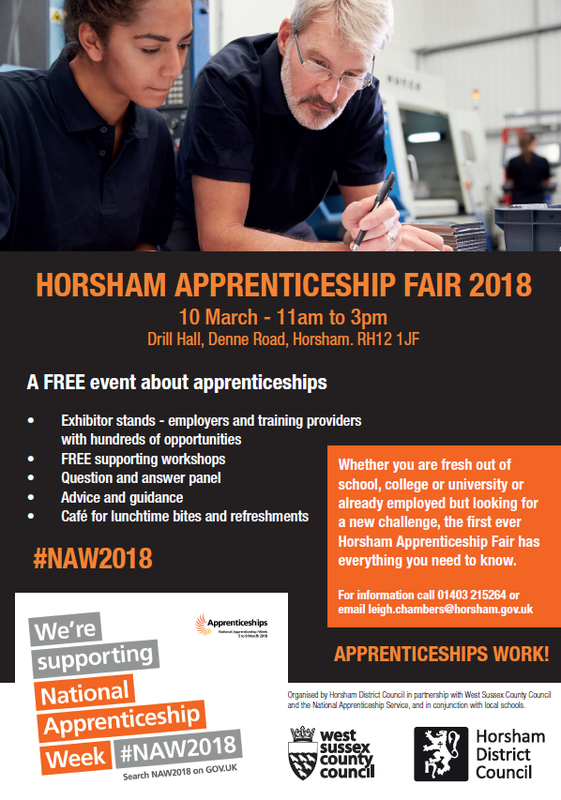 There will be an apprenticeships and traineeships fair on Thursday 14 March at the Harlands Road College Site, Haywards Heath. The event is open from 16:00 - 19:00. This is an opportunity to discover apprenticeship opportunities, get careers advice and meet local apprenticeship training providers. For more information, contact apprentice.network@westsussex.gov.uk. There will be a careers fair at Worthing Assembly Hall on Thursday 27 September for schools, the public and job seekers to find out what careers and opportunities are available locally. The event is open to schools during the day and then open to the public from 15:00 - 18:00. Brighton Centre on Tuesday 10 July, 16:30 - 19:30. West Sussex and Worthing Councils are jointly holding an Apprenticeship Fair on 4 July, 16:00 - 19:00 at the Broadwater campus of GBMet College. This is an opportunity to discover apprenticeship opportunities, get careers advice and meet local apprenticeship training providers. For further information contact apprentice.network@westsussex.gov.uk. Hastings Stade Hall on Wednesday 21 March 2018, 17:00 – 19:00. Both events will host a marketplace and panel discussions by employers and providers, supported by apprentice ambassadors and independent advice organisations. For further details and to book a place, please see www.c360.org.uk/NAW2018. A free event about apprenticeships during National Apprenticeship Week. We are looking for current, or recently qualified apprentices with the ambition to inspire others. You will learn to share your apprenticeship experience, making young people aware of the opportunities out there by talking in schools and colleges. If you are interested and want to find out more, please read 'Be an apprenticeship ambassador', and contact trish.varndall@apprenticeships-in-sussex.com.